For me, one of the quintessential summer foods is roasted corn. And now I don’t have to wait for the next barbecue or summer festival to get some. I’ve found three roasted corn stands in the Seattle area that make succulent summer corn even better by slathering it with margarine, mayo, spices, lemon and parmesan cheese. The first stand I encountered is located next to Tony’s Market in West Seattle (9050 35th Ave. SW, Seattle 98126). Check out pics on the West Seattle Blog. A few miles east in White Center, there’s another roasted corn stand next to Taqueria La Fondita #2, one of the best taco trucks around (9811 15th Ave. SW, Seattle 98106). Some of the workers at the corn stand were eating watermelon with the same spice mix they put on the corn. I’ll have to try that! On Beacon Hill, there is Roasted Corn El Oaxaqueno located in the parking lot of MacPherson’s Fruit and Produce (4500 15th Ave S., Seattle 98108). The Tofu Hunter has a good review and photos of this stand. I’m debating whether to go to the Bite of Seattle. Is it worth my time, money and stomach space? The Bite used to be a must-attend event for me. Before going, I would memorize the site map, pore over the list of restaurants and strategize what I wanted to eat. It was a fun way to experience new foods and flavors. The Bite introduced me to couscous, alligator and Tom Douglas’ divine donuts. Maybe I’m just getting old and cranky, but for me, the Bite has lost much of its appeal. The quality of food has seemed to decline, and there have been few culinary surprises. Do I need to temper my expectations? 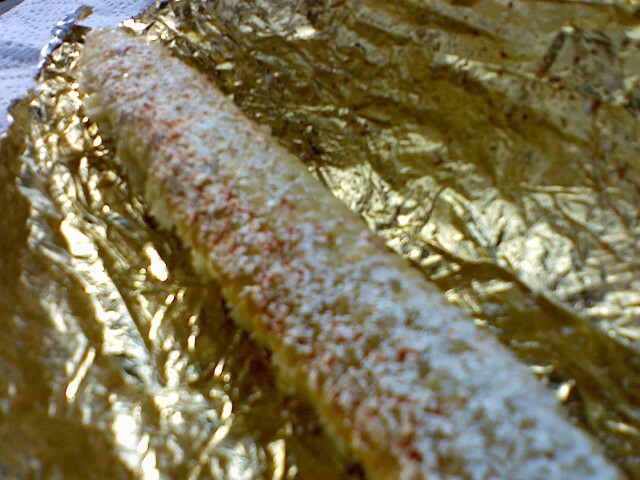 Maybe the Bite is less of a food event and more about hanging out in the sun and people watching…while eating a Philly cheesteak, spanakopita, yellow curry, fried chicken and Hawaiian shave ice. Please excuse my lack of blogginess lately. I just realized that it’s been a whole month since I posted anything new. It’s not that I’ve lacked for food adventures. I just need more time! I have an eight-month-old, and it’s easy to get lost in babyland–especially since he’s started crawling. I’ll do my best to start posting at least once a week again. Thanks to my friend Tara for calling me out encouraging me to blog. So let’s start catching up. On the Fourth of July, I celebrated the nation’s birthday as I felt all Americans should–by watching baseball and eating cream puffs. My husband and I joined friends at Safeco Field to watch the Seattle Mariners take on the Detroit Tigers. I’d heard that Beard Papa’s–a Japanese cream puff chain that has a cult following–had just opened a location inside Safeco Field. What’s a pastry shop doing inside a baseball stadium, you ask? It makes sense when you consider that lots of Japanese baseball fans visit Safeco Field to see Ichiro. Papa Beard’s is strategically located next to the Rice n Roll sushi stand. Anyway, I’d heard rave reviews about Beard Papa’s and had to check it out for myself. They looked and smelled great (I’ll post photos soon) but I wasn’t impressed by their taste. The pastry was nice and fluffy, but the custard was unremarkable. Plus one cream puff cost $4.00! I realize this is probably the inflated sports stadium price, but still–I felt like Ichiro must have when he was nailed by a Kenny Rogers fastball late in the game–surprised and a little angry. However, all I had to do was look at the charming Beard Papa’s logo, and I was soothed. 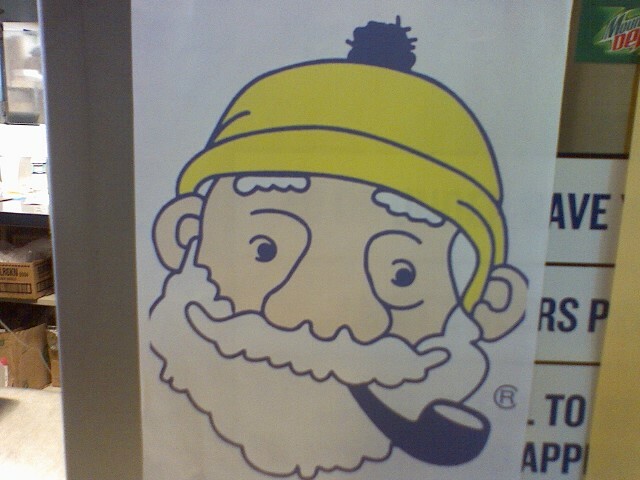 It’s a cute old man with a fluffy white beard, wearing a yellow knit cap and smoking a pipe. He seems like a kindler, gentler rendering of Ernest Hemmingway. I can’t decide whether the Beard Papa story is meant be serious or not. I find it hilarious. Another Beard Papa’s location is opening in the Uwajimaya food court. I will definitely go there for another taste. I’m especially intrigued by the green tea cream puffs. P.S. The Mariners won the game, 4-1.